Regarding current discussions about delisting the grizzly bear in the Lower 48 states, and the apparent disagreement between biologists, activists, conservationists and others: I’d like to share my perspective on this issue. It’s like the story of the two Zen philosophers discussing a glass of wine. One says that the glass is half empty, the other says that it is half full. One is optimistic and the other pessimistic. The current situation with grizzly bears is sadly, superficially, similar. If we view all of North America as a glass with grizzly bears in it, the first thing we discover is that the Zen philosophers have poor eyesight. They’re not sure what the current level in the glass actually is. In addition, someone has already drunk a lot of the wine, and they aren’t sure quite how much there was to start with. The optimist (who favors delisting) says that the glass is half full. The pessimist (who favors keeping the grizzly bear on the Endangered Species List) says that the glass is three-quarters empty. The optimist thinks that the glass originally was overflowing and it looks to his uncertain sight that the level is now near the middle. The pessimist thinks the glass was once close to full, but now most of it has been emptied. Smudges on the glass and poor eyesight make it hard for either one to see clearly; this is analogous to the difficulty of counting how many grizzly bears are actually here now. If we focus the discussion on the Lower 48 states, which is the legal arena in which the delisting argument takes place, the disagreement becomes amplified. The same uncertainty over the original conditions exists. One of the philosophers (the optimist) is extremely near-sighted. He thinks that the glass is 2 percent full, and may actually be increasing to 2.2 percent. He is so close to the actual wine in the glass that he has lost sight of how much there once was, and from his magnified perspective it looks like plenty. The other philosopher can see it from farther away. He thinks that it is 98 percent empty, and that whether it is 98 percent empty or 97 percent empty is not a significant issue. From his point of view it is almost gone. Both philosophers are fond of wine, and bears, and would like their descendants to be able to look into the glass and share its beauty. Both would like to put a little more wine in the glass so that it is in less danger of evaporating and will last for a longer time. The optimist thinks that 2 percent full is OK though and that he can relax. It means that he has done his job well. His superiors will probably reward him if he can convince them to see it his way. He thinks that some day he may be able to make a pilgrimage to Alaska where the glass is much fuller. He may even get to take a sip of it there. The pessimist sees the loss of most of the wine in the glass as a failure on his part, and on the part of the optimists who are charged with saving the wine. He knows the glass will never be even close to full again, but he wants to be certain that it does not get any lower than it already is. He wants to do everything possible to ensure that things don’t get worse. 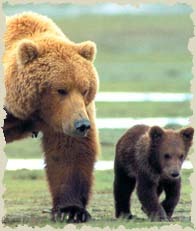 Keeping the grizzly listed is the only way with legal safeguards to do this. You can carry this analogy to additional lengths, e.g., some of the philosophers think wine is evil and that we should dump it all out; some are wine lovers and want to fill the entire glass again. Most of us Zen philosophers I think feel that being able to look at what’s left in the glass (or even just knowing that there is a glass with a little wine somewhere) is a human right and a privilege. We wouldn’t want to be the one responsible for letting the wine evaporate. I think you can get the picture. We should therefore protect the last few drops of wine as carefully as possible. Lance Craighead – Opinion*Idaho Falls Post Register 1999.